Kitchen cabinets are the most important aspect of a kitchen remodeling project. Cabinets are not only functional, but can be beautiful as well. Materials like wood, metal or glass can transform your kitchen into a room of timeless beauty. There are also many options to consider when it comes to storage and organizing everything in you kitchen. There are spice racks, wine racks, slide out drawers, bins, knobs and door handles, under cabinet lighting, and even trash bin accessories. At Kitchens by Hastings we understand that kitchen remodeling can be a difficult process, so we want to help take the anxiety out of your project. That’s why Kitchens by Hastings offer great products from the best companies in our industry, like KraftMaid, QualityCabinets®, Mid Continent Cabinetry, and Custom Cupboards. When your kitchen cabinets are complimented with the right selection of granite, tile and hardware you can achieve your own unique design. So when you decide to remodel your kitchen, make Kitchens by Hastings your partner, after all we are the experts when it comes to design planning and installation of a remodel, or a new kitchen. 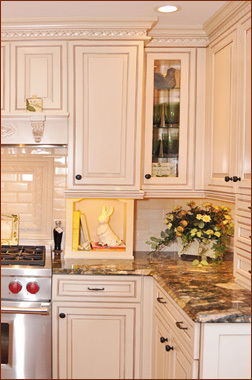 By hiring Kitchens by Hastings for your new cabinets, you get the best product and craftsmanship at a reasonable price. Best of all, when you buy kitchen cabinets from Kitchens by Hastings you are buying from a local company you can trust, with an excellent service record and a superior product. Kitchens by Hastings services Boston and the North Shore including, Saugus, Danvers, Middleton, Lynnfield, Wakefield, Peabody, Marblehead, Swampscott, and Beverly.